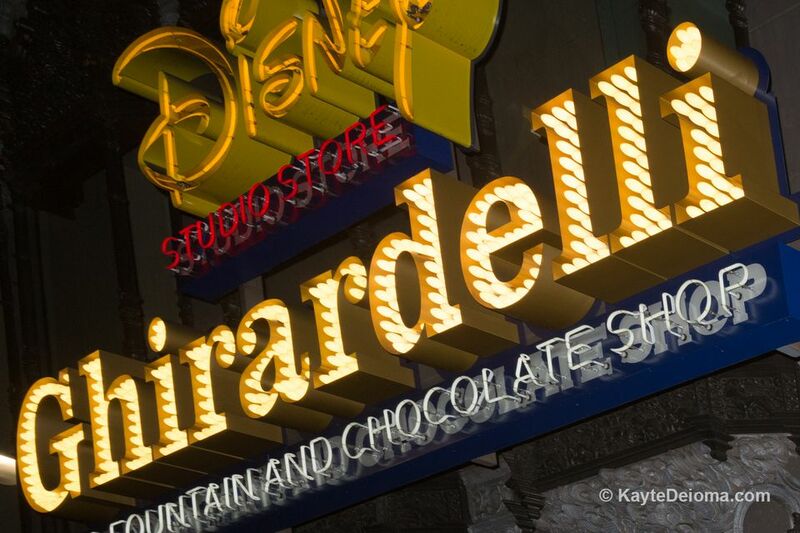 The Ghirardelli Soda Fountain and Disney Studio Store are located at the El Capitan Theatre in Hollywood. You can enter from the street or through a connecting door from the lobby of the El Capitan Theatre. Ghirardelli took over the Soda Fountain part of the operation in November 2013, redecorating and converting to their traditional menu. Ghirardelli's version of the Soda Fountain has replaced the old-fashioned ice cream parlor and soda jerks with their signature sundaes and a few shakes and floats, as well as a full coffee menu. The chocolate is Ghirardelli from San Francisco, and the ice cream is from Dreyer's, a Nestle company. The non-sweet menu has been eliminated, so no more Mickey Mouse PB&J or grilled cheese for the kids. The interior lost some of its charm in the makeover as well, but the Soda Fountain is chock full of sugary choices if that's what you're craving. Although the Mickey Mouse sandwiches are gone, Disney fans may enjoy the Pin Trader Delight Sundae that comes with a limited edition Disney trading pin. Four pins are released at a time from different Disney movies and you can choose which one you want to go with your Sundae. The right side of the shop is still the Disney Studio Store with Disney DVDs and merchandise and some children's costumes from various Disney movies. An interactive kiosk gives you access to the entire Buena Vista Home Entertainment catalog with old, new and hard to find Disney DVDs and videos. Check the Disney Store Hollywood Facebook Page to find out about new pin releases for the Pin Trader Delight Sundae and special Disney Studio Store events. Some special events, like huge new merchandise releases, may take over the store for extended hours and preempt normal operations for both the Disney Store and the Soda Fountain. During the September 2015 Star Wars Force Friday merchandise event, no Pin Trader Sundaes were sold for two days. Overall, The Ghirardelli Soda Fountain and Disney Studio Store is a fun place to go for ice cream with the kids as long as you prep them ahead of time whether there will or won't be any purchases made at the Studio Store. Unfortunately, the Disney souvenir bowls, which used to come with some of the ice cream dishes that at least gave kids something to carry out with them if you're not shopping are no longer part of the program.